Our mission is to serve the people of Shawnee County with voluntary programs of education, planning, and application of conservation practices to sustain the long term quality of our soil, water, air, plant and animal resources in balance with human needs. We encourage you to browse our site for information on topics such as How To Properly Build A Pond Dam, to learn about Conservation Practices or Non-Point Source Pollution. You can also search our site for information you need. 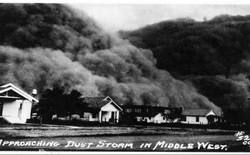 Severe soil erosion problems during the Dust Bowl prompted the passage of the Conservation District Law by Kansas legislature in 1937. This legislation lead to the formation of conservation districts in Kansas. Through the years additional natural resources conservation challenges have emerged. The conservation district is the primary local unit of government responsible for the conservation of soil, water and related natural resources within the county boundary. Kansas conservation districts are political subdivisions of state government charged with this vital role. Funding comes from county and state allocations, with some districts generating funds by providing conservation goods and services. Streambank cutting into crop field and exposing several feet of an electric power pole. Power poles moved back, rock veins installed up in the bank which was reshaped and vegetated. Good vegetation coverage after just one growing season. Crops are planted away from the stream bank. What Stacy says about it: "When I began the process of trying to apply for funding for my Streambank Stabilization Project, I feared that it would be extremely time consuming and difficult process. The personnel in the Conservation Office were extremely helpful and I found that it was not that difficult of a process and now that it is complete, I am very happy with the outcome of the project and the appearance of the site involved." The Kansas Department of Health and Environment has provided financial assistance to this streambank stabilization project through EPA Section 319 Nonpoint Source Pollution Control Grant #2005-0070.